I have not posted in a few months because I was not observing any exceptional birds. The summer shorebird season was disappointing, with nothing new for me but the common and expected Semipalmated Sandpiper. There is still time for shorebirds, as two of the best from last year arrived in the late-September to early-November period. Raptor movements have been sparse due to prevailing winds with easterly components. Still, I have managed to see the usual Osprey, Broad-winged Hawk, and Red-shouldered Hawk, the latter two only in very small numbers. Then, in just the last eight days, I added five new birds to my year list. Today, the 29th, a birder visiting from the West Coast reported on eBird seeing a Dickcissel in the Maintenance area of the Ramble sometime between 10:30 and noon. The description checked and the other birds on his list made sense, so I ran to Maintenance shortly after seeing the 12:23 eBird Rare Bird Alert. The eBird report suggested to me that the bird had been on the small lawn directly east of the all-metal maintenance shed. It was said to associating, as Dickcissels often do, with a flock of House Sparrows. There was a such a House Sparrow flock there, occasionally drinking from the water that collected at the base of a public fountain. I stealthily watched the fountain area for fifteen minutes. No Dickcissel. I also checked the perimeter of the area, which included the Maintenance Meadow proper. After forty minutes I still did not have the bird. Then I decided to look into the northeast corner of Maintenance, where I could see some House Sparrows feeding atop tall grasses and weeds and occasionally perching on the wire fence that encloses the entrance to the shed. Soon the Dickcissel appeared on the tall grass. Of the several Dickcissels I have seen in Manhattan, this one had the brightest yellow breast. It also had a very yellow supercilium. Paul Sweet’s American Museum of Natural History midday walk was at Maintenance, so I told Paul about the bird and he brought the group over. After some minutes of searching he found the Dickcissel perching on the tree. The Dickcissel lingered in the general area for the entire day and was seen by many. After finishing a midday workout, I was considering going to the Hudson today to watch for waterfowl driven to move by the sub-freezing overnight temperatures. I returned to my apartment and saw a NYSBirds posting alerting me to a more proximate opportunity: one of Manhattan’s most accomplished birders, Peter Post, had reported a Dickcissel in the Central Park Pinetum. I had just several week ago chased a reported Dickcissel on the Great Hill only to find that it was actually an exotic escaped bird, probably a Yellow-fronted Canary. I had no doubt about the one today, however. Mr. Post is a noted expert who has been birding Central Park since long before I was born. I arrived at the Pinetum roughly 40 minutes after Post’s 1:38 p.m. report, and no one had seen the bird since the original sighting. I was encouraged to see that Post, with his camera, was still looking. I surveyed the surrounding area, checking the Pinetum’s inner circle and also the newly-seeded lawn that had attracted many sparrows in recent weeks. Just after 3 p.m. I saw some birders running and a camera flash going off. I ran toward them, to the area where the bird had originally been seen, the very northeast edge of the Pinetum just northwest of the Great Lawn. The Dickcissel was on the grass only twenty feet from the wire fence, but it did not stay there long. Camera flashes seemed to frighten it, and it flew up into a pine tree and then, apparently, away. I had gotten a good look, but I wanted to see it again, so I went off looking for it. Most of the other birders stayed in place. After twenty minutes it reappeared on the same lawn from which it had flown. It eventually gave all birders extended, close looks as it walked across the lawn. It had only a hint of yellow on its eyestripe and a dull grey breast. It almost certainly was a female, or possibly an immature bird. 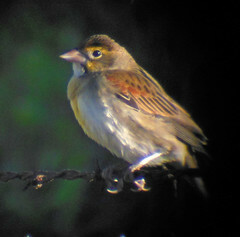 I had had the Inwood Hill Park Dickcissel in December 2011 and January 2012, so it was not a life Manhattan bird for me. It was, however, my first Central Park Dickcissel, and species number 196 for me in 2013 in Manhattan.